Spiderweb turquoise and turquoise engagement ring or wedding ring with a pear shape blue topaz set in sterling silver by Mark Hileman. This turquoise ring would make a unique wedding or engagement ring for someone looking for a non-traditional wedding ring option. 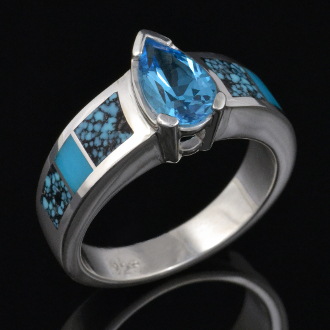 The ring is inlaid with Kingman spiderweb turquoise accented by a plain blue piece of turquoise in the center of the inlay sections. The pear shape blue topaz looks great with the blues in the turquoise and weighs just over a carat (1.04). The width of the main part of the ring is 6 mm with the topaz extending out to 9 mm at the widest point. It tapers down to 3.5mm at the bottom of the shank. The ring in the photo is shown in a size 6 1/4+ for scale. This ring will be made to order in your ring size in approximately 3 to 6 weeks depending on the work load. A matching turquoise wedding band is available if you would like to make a set. It is very important that you give us your correct size when ordering as it is difficult to adjust the size without using a laser welder and risking damage to the ring. The paper finger sizers you might find on the internet and print out are not accurate. We have experimented and found that they vary from 1/4 to 3/4 of a size in error. Please visit a local jeweler and get your finger sized properly. We depend on you, the customer, to provide us with the correct size so please do not estimate or guess. Special order size rings are NOT RETURNABLE.